We have a steady supply of quality tanned coyote faces. These coyote faces come from Canadian coyote skins that are used to make collars for top-of-the-line parkas. They are ideal gift ship items for children and are ideal for craft projects. The #1/2 faces have noses that do not lay as flat and may not be as full faced as the select faces. The assorted coyote faces are a run and are not sorted by quality. 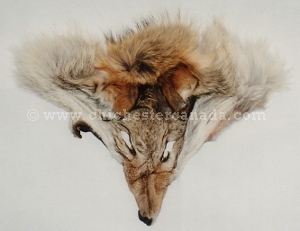 These are natural coyote faces, i.e., they are not dyed.